Swiss Army Knives are known for their utility. But that utility has pretty much remained in the realm of tools. That is until Swiss knife expert Victorinox took on the challenge of technology and developed their line of USB flash drives. Remember the Victorinox Presentation Master last year? And now, with the new Victorinox Swiss Army Jetsetter USB flash drive, the famed utility toolset is attempting to again join the ranks of technological innovative companies and hoping to update its image with it. But is Victorinox’s step towards technology as much of a success as it could be? Not quite. The Swiss Army Jetsetter is a USB flash drive coupled with a couple of tools to fit the Swiss Army definition of utility. It comes in three storage capacities: 8 GB, 16 GB, and 32 GB. The USB flash drive can be detached from its casing (which could be easily mistaken for an actual Swiss Army knife) and is shock- and water-resistant. Seeing that it’s made expressly for Apple, the device is already loaded with security software for Mac products. 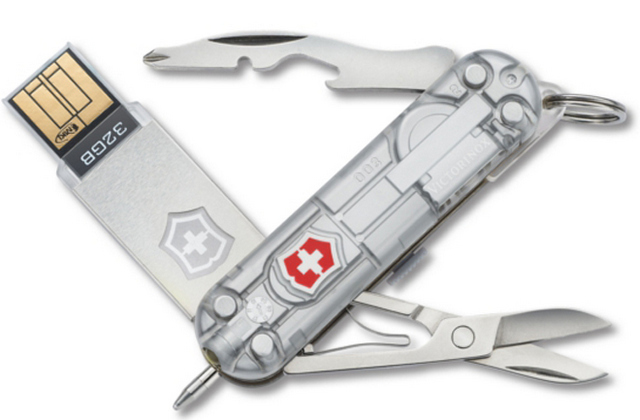 What makes the Jetsetter USB flash drive more “Swiss Army” than previous releases from Victorinox is that the model includes tools that may come in handy from day to day; the tools vary with the size of the storage capacity. The 8 GB version is black and comes with more than a few tools, namely scissors, a nail file, a screwdriver, tweezers, a pen with blue ink, and a clamshell package opener. Less than what you would have on a Swiss Army knife but still decent. The 16 GB version comes in red and has scissors, a bottle opener, a magnetic Phillips, a wire stripper, tweezers, and a pen. The 32 GB version is available in a finish called Silver Tech. It has the scissors, bottle opener, Phillips screwdriver, wire stripper, tweezers, and pen of the 16 GB version and includes an LED light as a bonus. Loaded with so many tools, you would think that Victorinox could pat itself on the back for a job well done. But not quite. Some users have faulted the company for the lack of a knife. There are also some consistency problems with quality control, mainly concerning the detachability of the flash drive itself. The Victorinox Swiss Army Jetsetter’s price starts from $39.95 for the 8 GB version to $99.95. This entry was posted in Victorinox and tagged 8GB USB Drive, Flash Drive Tool, Jetsetter, Swiss Army Drive, USB Flash Drive, Victorinox. Bookmark the permalink.